Print plastic bags with your most important message. Handed out to one customer, but seen by a hundred potential customers: exclusive plastic bags! Printed plastic bags in your design – and carrying your identity – are one of the most effective advertising media possible, and cost only a small investment. With a minimum order of only 1,000 pieces, you can buy your design on a printed plastic bag from us. Even small businesses can use this method of advertising with great results. These inexpensive eye-catcherss create an enormous brand impact and are useful to any type of business. Whether inexpensive or high-class, vertical or horizontal format, very small or relatively large: exclsuive plastic bags can be printed to suit your specifications. Almost any design is possible – from a small logo up to a complicated photo design. Plastic bags can be printed or dyed over their whole surfaces and offer almost 100% of their exteriors as advertising space. Set a tone, spread the word about your business, and generate buzz in the city – it's all possible with printed plastic bags. See-Through Bags. Transparent plastic carrying bags with your design. When you choose a transparent foil bag, you can communicate directly and transparently with your customers. 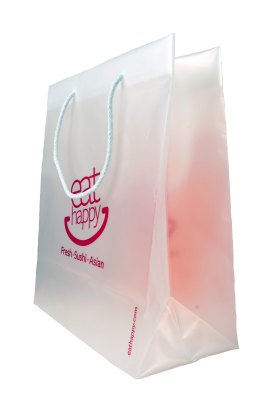 We would be happy to help you create your design on an opaque or on a completely transparent bag. 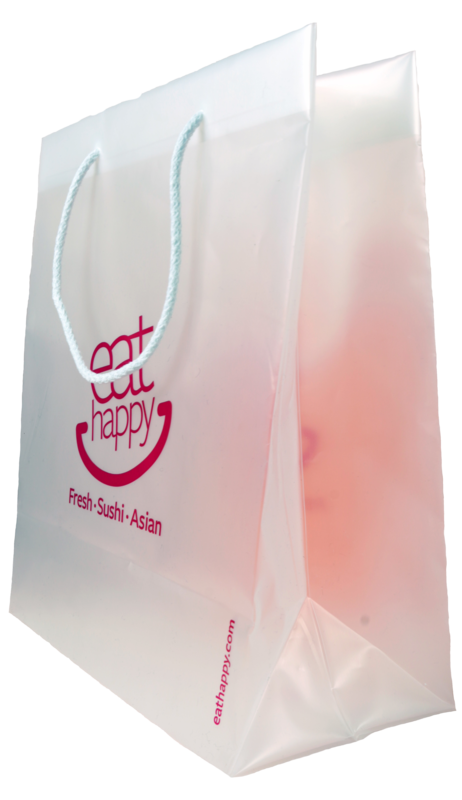 The transparent foil bag combined with the print on this see-through surface, which seems to float before the customer's eyes, as well as the products or broschures visible inside the bag all come together to create an attractive effect and cause the customer to attribute transparency to your business. Besides communicating the meta-message of transparency, these bags can also partially or completely display to customers what you are able to deliver – a friendly form of product placement. A whole series of printed plastic carrying bags are available to every type of business, whether it's representing itself as a classy designer brand, a retail shop, or as an exhibitor at a trade fair. Your Brand. Your Corporate Identity and Printed Plastic Carrying Bags. Plastic bags printed with a design integrated into your promotional campaign can become a mobile, independent delivery system for your brand and its perfect slogan, and can help execute your marketing campaign. Using this bag as part of the action allows your brand to be permanently present without any additional effort on your part, allowing you to carry on your promotion while the bag proclaims which exhibitor produced it. By controlling such seemingly small details, you demonstrate mastery of your corporate identity and the action of your team. You secure your brand in the minds of onlookers. Every team that finds itself in motion: contacting customers at trade fairs, in presentations, and in pitches, will be happy to have promotional materials in hand to offer the customer: a modern plastic carrying bag is a little helper which makes everything easier by providing a tangible evidence and memorial of the customer's interaction with your brand. PE Plastic Bags are Presentation Bags, and Bags That Seal Contracts. They Create Personal Communication With Clients. Individualized bearers of your corporate identity make it easier to have discussions and create contacts; they create the space and atmosphere by the presence they exude. It's best to have a bag available for passing along the most important information to your clients, so that you can hand over the most important information when you've concluded business. Simply telling your clients something, or worse grabbing promotional materials and contracts out of your briefcase and pressing them into his hand, makes a poor impression. We don't simply press tips into our waiters' hands – there's a right way to do everything. Tips belong on the table, and promotional materials and contracts need a presentation bag. By creating a little distance, they allow for the right amount of space for communication in a sales situation. Promotional bags are a part of personal communication; in video conferences, of course, you can't hand over a presentation bag. As a decision-maker, you need to support your business and your team in its personal communication; in the difficult, decisive moments where they meet clients. Support your team by allowing it to make a perfect impression. Give them what they need whether they're representing your brand at trade fairs, with clients in sales talks, or giving their all every day at the point of sale. Every team member wishes for a bag in some situation in order to communicate your corporate identity to the customer. No one wants to simply shove a signed contract into a briefcase or be left with only the digital magic of a contract signed online.